A special launch event for the South Wales Teddies for Loving Care (TLC) initiative took place on Friday, September 23, at the Noah’s Ark Children’s Hospital for Wales. The aim of TLC is to give free teddy bears to children who are distressed when they visit hospital accident and emergency departments to help calm them down and enable medical staff to communicate effectively with the child through the teddy. The scheme is operated by South Wales Freemasons, who aim to raise enough money to deliver 20,000 cuddly toys annually to A&E units in Cardiff’s University Hospital of Wales, Bridgend’s Princess of Wales Hospital, Swansea’s Morriston Hospital, and Noah’s Ark Children’s Hospital For Wales. The teddy bears, which have all passed stringent toy safety regulations, will be handed out by medical staff to children who are experiencing trauma, injury or illness. 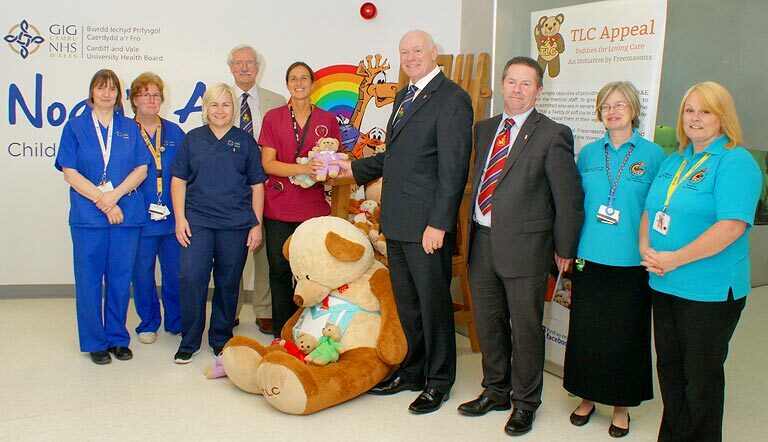 The first delivery of TLC teddies have already been delivered to UHW, Bridgend & Swansea, due to generous donations by South Wales Freemasons over the launch weekend which has provided enough initial funds to help 2,500 children & their families through provision of teddies. A huge team of volunteer Freemasons have been established to order and distribute the bears twice a month, while other people will head up the organisation’s fundraising arm. This entry was posted on Thursday, October 6th, 2016 at 9:09 am	and is filed under News, TLC.